Learn how to prune apple trees in the Newburgh Community Orchard. These 7 visitors came from Thiron-Gardais in central France, where the Tironensian order of monks was begun. 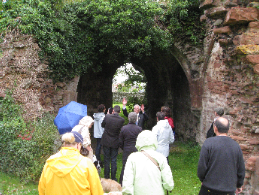 Lindores Abbey was a Tironensian abbey, and the culture of orchard-planting which is so rich in Newburgh was begun in Thiron 900 years ago. 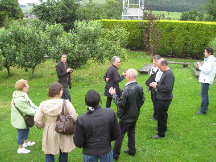 The visitors were interested in the Abbey, the Community Orchard, the Museum, Denmylne Castle and one of our long orchard gardens. They were keen to establish cultural links and exchanges with Newburgh.